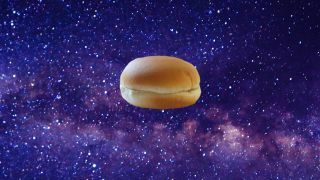 The last time a sandwich was in space was 1965. The two astronauts on Nasa's Gemini 3 mission snuck a corned beef sarnie into the pocket of a spacesuit and snaffled it in orbit. When they returned to Earth, they were severely reprimanded. The crumbs had gone everywhere in the microgravity, and Nasa warned that they could have got into the astronauts' eyes or started fires under the electrical panels. Since then the menu has been 100% tortillas. Now, however, a German-based company called Bake In Space has created a "crumbless" bread that could change everything. The firm has developed a bread mixture and several oven designs which will be tested next year on the International Space Station. “As space tourism takes off and people spend more time in space we need to allow bread to be made from scratch,” Sebastian Marcu, the company's founder, told New Scientist. The first problem to solve is the design of the oven. Most traditional ovens rely on convection to spread heat, but that doesn't work so well in microgravity. They also require large amounts of energy that are tough to get on the International Space Station. But engineers are also thinking about vacuum baking - where the pressure inside an oven is lowered. Low pressure means water boils at a lower temperature - so that baking can happen more easily. Various different approaches will be tested on the European Space Agency's Horizon mission in April 2018, complete with video feeds from inside the oven. “Bread could have a completely different structure,” says Marcu. Plus, it's hoped that bringing bread into orbit could yield more than just nutritional benefits - the smell of fresh bread could be an important morale boost. Just what you need when you're floating in a tin can, far above the Earth.